On May 4th, 2013, DOCM (Deaf Open-Caption Movies), viewed “Iron Man 3” for it’s 14th Deaf event. This is the 1st Anniversary since Joe Cepeda started this event on May 2012. This event was sold out for 147 tickets. DOCM monthly events are growing strong and popular for the Deaf Community in San Antonio. Joe couldn’t able to attend this event due to his wife passing away on May 2nd in Oakville, Ontario in Canada while Michael Razzen and Nikki Gomez temporary replaced Joe’s role as hosts the the DOCM. They had an anniversary cookie cake to celebrate for this event to the Deaf Community friends. Robert Downing Jr. as Tony Stark, billionaire and popular armor suit for the third installment of Iron Man films. This is his fourth film of Iron Man includes Avengers. Tony made a huge mistake for giving his mansion address to Mandarin for live television reporters. Terrorists have destroyed Tony’s mansion. How would Tony survive without his back-up suits? What is Tony mission to capture or kill the Mandarin? Tony had stress disorder and lack of sleeps daily to work on his projects to improve his advance technology for hid new suit. 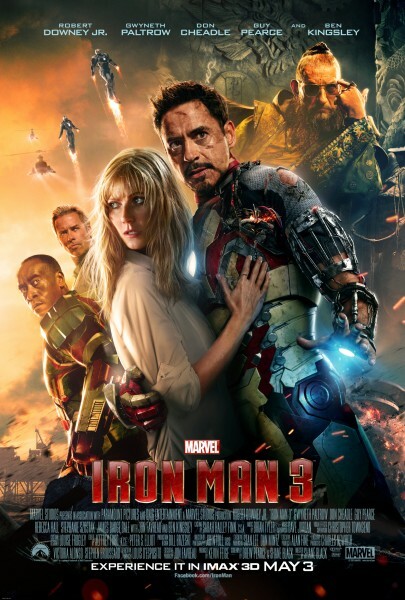 Iron Man 3 is an inspiring action and technical film, that you don’t want to miss during this hot summer 2013. Don’t forget to stay at the end of the movie to watch the post credit scene. Special thanks from DOCM fans and the Deaf Community to Brandon Arceneaux, CEO of Alamo Drafthouse Cinema and Liz Burtz, Director of Special Events. We applause Michael and Nikki for all their hard work with creating, making and promoting our monthly DOCM flyers at the San Antonio College Interpreter Program and Facebook since May 2012. Thank you Brandon & Liz for your support to the Deaf Community! A friendly reminder, all of our DOCM events are on Facebook. Once logged on, you can view the selections offered and vote. If you are new, you can create a username and password, then join the fun. Please log onto Facebook and type in DOCM for the vote poll. If you have not signed up, please do so. Once signed in, you will be able to read the post and vote. The link for DOCM is www.facebook.com/pages/Deaf-Open-Caption-Movie-DOCM/210705502306722. We look forward to seeing everyone again at the 15th DOCM event for this month. It will be another popular movie for the Deaf Community on the same month of May.